We have a great sketch this week at Merry Monday! This design would be great for mass producing cards. I flipped the sketch and kept it clean with just a little bling! Can't wait to see what you create with the sketch. 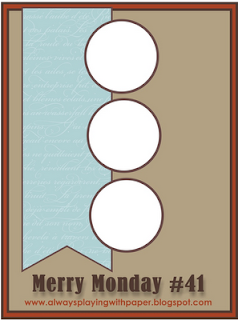 I added a few layers to the inside of the card to finish it out. Beautiful colours Allisa, love the snowflakes blinged out too! 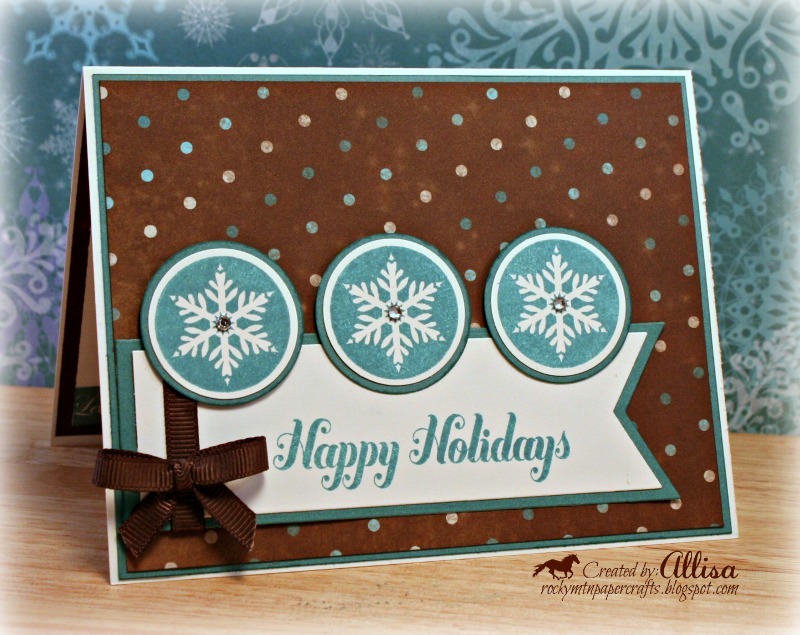 Wow, Allisa, I love the combination of the rich, chocolate brown and blue! How striking! This is lovely. Really into clean and simple right now. Thanks for joining us over at the Joanna Sheen Challenge. Good luck. This is beautiful...that Twilight ink is a gorgeous color! I love your card, Allisa! 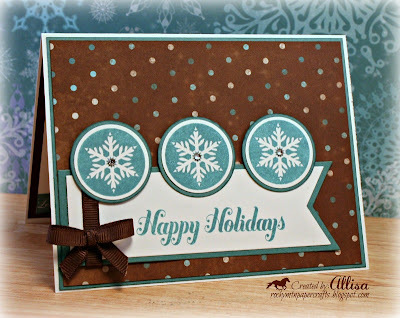 Love that you turned the sketch sideways and really like your use of untraditional colors for your card! So simple but so pretty! This is such a pretty CAS entry. The colours you have chosen to use just promote an image of warm and cosy. Thanks for playing along with us at Stampin' With the Dragon. Hope to see you again. Crystal DT. Beautiful Christmas card Allisa. Love your colour combo and the clean and simple lines. Love the papers and colours you used Allisa, very pretty card. What a fanastic card. Love the snowflakes! Thanks so much for joining us this week at Digital Delight Challenges. Gorgeous card Allisa (again!) 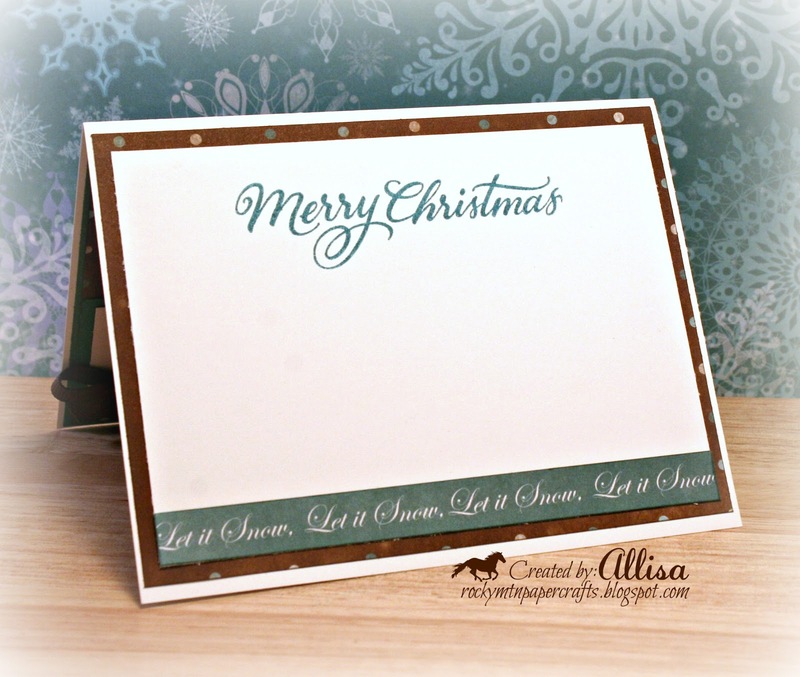 Lovely combination of colours on your card.and your sentiment is fabulous! I adore this! I love the simplicity of it but how it just looks classic. Thanks for joining us at Stamping with the Dragon!